It wasn’t my first time to trust strangers that I just met, but it might be the very first time I trust the strangers that I just met that they’re purely accept me for who I am, ignoring the identity of where I am from, my religion, the language that I speak, my accent, my camouflaging Chinese look, etc. The journey began when I started planning my trip with my friend, Bidari to Philippines and Hong Kong. As an independent young lady, I admit that I haven’t traveled much, and that also means that Hong Kong is so far the furthest destination that I have been until now. A far destination pretty much implies that this gonna be the most expensive trip that I have to bear. For the ticket matter, it wasn’t that much expensive, it was just about… Okay, I advise you to hold your breath first before you got surprised knowing how much I should pay in total for airplane tickets to three destinations in two countries with normal online booking procedure. Ready? I spent only around IDR 2 million or less than US$ 200 to fly six times to these destinations : Manila, Cebu, and Hong Kong. That’s uber cheap and even cheaper than round trip tickets to fly to East Indonesia from Jakarta. Obviously the cautious of expensive budget burden is pressed down. The next budget matter = accommodation. Couple of my friends ever told me about a social network for travelers who’d like to stay at people’s house (most likely complete strangers) in different cities / countries, vice versa with the ability of us to host people who come into our city. That social network is Couchsurfing. Sounds like anything can happen, and my initial thought was quite scary about that platform, like : What if your host is a bad person that will do bad things to you? Having suppressed that thought (the budget pressure seemed to win the battle), I signed up to the site and I observed the system there, like giving a reference to people. Shortly, you can write positive or negative reference to those you ever met, and if you had bad experience with your hosts/surfers/travelers you met, you can give them negative reference that will bring impact to that users’ reputation and credibility. So yeah, that’d be exactly easy to guess that I tried to find hosts for my trip from there. In Couchsurfing, you can search for hosts per destination that you are about to visit, and you can see your potential hosts’ profile. Not just about the basic information, you can also see how many and how people gave them reference, the places that they traveled, their philosophy that might define their personality, and traveling style, perhaps. Now let’s begin the first part, the story when we arrived in Philippines. So, I and my friend were going to see our host in Manila named Irene. She’s Filippino, her age is around 31 years old, and from what I saw on her profile on Couchsurfing and Facebook, she’s an adventurous lady who loves to go surfing. The reasons I picked her and sent her a Couch request were because she looked communicative, friendly, easy going, but genuine. The many references given to her on her profile said so, and she had collected many positive references. Before coming there, I had online chat with her telling about my itinerary and the plan or time and venue for us to meet, so there I met her in a MRT station, of which the name I can’t remember. Having her number on my phone, I could contact her easily, and she said if she was already arrived at the station nearby the ticketing counter. I saw her wearing a t-shirt and knee-length skirt, and she waved her hand towards me. Unpredictably, she’s taller than me, and she looked different from the photo she put on her profile, she looked even nicer and friendlier when I met her in person. From her photo I saw online, I thought if she was a high class person who paid attention much to public image and reputation, but the truth was completely different, she's a very down to earth Filippino lady. So she walked us by MRT to her home, then we continued with taxi to reach her house (the taxi in Philippines have the driver sits in the left side, unlike in Indonesia). Manila is really similar with Jakarta, so her house just looked like Indonesian house in terms of architecture. Until there came a surprise, that she had a dog. OMG, being afraid of a dog, of course I was afraid of her dog, luckily, her dog was put outside separated with the front yard. I entered her house and she gave us a room, a dedicated room for guest. There’s a double bed, cupboard, wardrobe, table, with the toilet outside. The surprising things about her room are some stuff that I found different, which were : the map of some destinations in Philippines, like Cebu, Boracay, etc that were kept on her bookshelf, (and we were allowed to take one), and the guest book which her guest will later write testimonial about my host, Irene. In Irene’s house, we only spent one day, because in the next day at dawn, we’re leaving Manila to Cebu by airplane. During that one day, Irene showed her Philippine’s kindness to us. She was very nice. She cooked lunch for us although she said if she were not good at cooking, and her Mother also cooked for us! Her mother lived in a different house, but in the same housing complex. She gave us a visit, and she brought us very delicious dishes. I really remember until now how tasty her caramel pudding and soup. My heart was saying inside that I would want to bring her caramel pudding home! (but we didn’t, and she gave us another delicious cakes that we brought to the airport later, instead). Irene’s Mother was also very friendly. And she looked like Indonesian, haha. 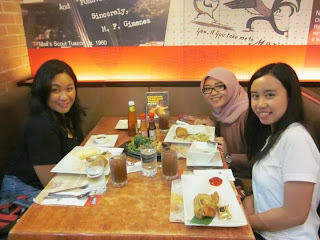 During our lunch, Irene shared her Couchsurfing and travel experience with us. Of course she had more experiences than me because she joined Couchsurfing before me. One of the lessons she shared was about to learn cooking so that we could show our local food to our Coursurfing friends, be it surfers or hosts. About her dog, well, couple times he entered Irene's house, coming inside (probably because he was starving), and of course I was terrified, and I said to Irene "Irene, I'm afraid of your dog." Irene told her dog to get out, but he came in again, and Irene kicked him out, he entered again, again, until couple of times, haha. I heard that Irene said "takot" to her Mom, and she seemed to refer that word to me. Well, "takot" in Filippino means "takut" in Bahasa Indonesia, or afraid in English. There are many similarities in words between Filippino and Bahasa, like : takot, kanan, mahal, mura, lima, etc. After finished our lunch, we prepared to go to Intramuros. Intramuros is a large complex of fort in Manila, built in Spanish occupancy, and it was very beautiful (and pretty well maintained). We went there in Philippino style, we took MRT and jeepney. To ride jeepney was a new and funny experience for me. To pay for the fare, we just need to give our money (it was only 8 peso) to the person sits next to us, and he/she will pass the money to the person who sits closer to the driver, until the money gets to the driver's hand safely. When we passed the money, we need to say "Bayat / Bayat Po". And when we asked the driver to stop, we need to say "Para". I was happy because I could learn how to live as a local. Since Intramuros was quite far, our host didn’t sure 100% of which transportation and direction we should take, so she often asked around. Finally we got to Intramuros, and it was cloudy at first, until the cloud turned to dark slowly. 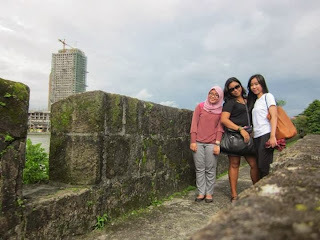 Intramuros was very big, and we walked instead of taking the expensive horse cart. The kindhearted Irene knew very well, that we, the ladies love to take photos of ourselves, then she often helped us to take our shots even without we asked. Intramuros tour was done, and next destination was Manila Bay and SM Mall of Asia. But wait, before we continue our journey, we need to have something to eat, at least snacks. Having said that, Irene took us to Ilustrado restaurant. It was a very nice restaurant nearby Intramuros serving Filipino-Spanish cuisine. We ordered an ice cream named Sampaguita ice cream and chicken porridge. Sampaguita ice cream was very unique, it smelled and tasted like a flower, I swear, but it was delish. It might be the most unique ice cream I ever tasted. Well, Sampaguita is a name of Philippines' national flower, so that's why. 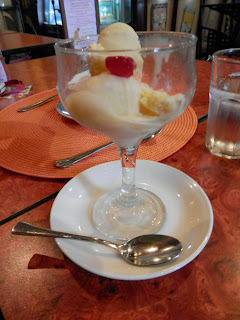 Not only the Sampaguita ice cream that was unique, but the chicken porridge, and even the mineral water, too. The chicken porridge was served with small-chops tofu, and the tofu was very crispy. The surprising thing was the mineral water, it didn't taste like the mineral water that we usually had, it had screw pine (pandan) aroma and taste! And it was free, hehe. I suggested anyone who visit Manila to come to Ilustrado, it was worth a visit. After we paid the bill, we continued our journey to Manila bay, and we took taxi to get there. The bad thing was the rain that forced us to hold our umbrella all the time and made us hard to take pictures. So we only spent like 5 minutes in Manila Bay, then we head down to SM Mall of Asia, the biggest mall in South East Asia, which was truly huge! We had dinner over there at Max’s (family restaurant with fried chicken as their specialty). The fried chicken was pretty good and not expensive, and there was a funny thing happened. We saw the Max's waiters and waitress sang! They sang everytime there's someone having a birthday, the happy birthday song, Filipino style, and they sang it well and plenty of times for different guests. Before I came to Manila, I told Irene that I wanted to see a live music in Manila in a restaurant or cafe, then after that "happy birthday performance", Irene asked me "So, you wished to see live music, now you see it plenty of times, again and again, haha". That was funny, really. After Max's, we went to supermarket to buy some stuff we need for our adventure tomorrow in Cebu. Shopped together in supermarket, we knew that Irene loved pink color, while my friend, Bidari, also loved pink, haha. Finished shopping, we left the mall, heading home, it was around 10 PM, and the rain got harder. We took the cheap but comfy AirCon bus, and we took MRT, and we took taxi to get home. It seemed that the rain took quite long that day, and there came flood! Surprise… when we’re about to enter the alley in Irene’s host, the flood said hello. I thought that Irene’s house was in free of flood area, but it wasn’t. The water was around 30 cm high, but Irene still insisted the taxi driver to drive in, until the car hit the lower water one in front of the gate. Irene went out from the car first, with her legs dipped in that flood to give direction to the taxi driver so that the car could move in a desired way. Later we noticed that Irene asked the driver to do so because my friend Bidari was wearing shoes and Irene didn’t want Bidari’s shoes to get wet. How kind she was that she was willing to do that, let herself wet with the flood, even we only got to know each other for twelve hours. So we got into her house and took a shower. Irene advised us to go to the airport catching our flight to Cebu earlier due to the flood, she advised at 2AM, instead of at 3AM like our prior plan. I could only sleep for 30 minutes, because I took shower, packed my stuff, and wrote in her guest book. Before I wrote, I read the previous pages, the pages of which her previous guests have written before me. All of the testimonials were positive, showing how kind Irene was. Then I began to write. Realizing that I will leave her house and say goodbye to her, my emotion got me feel sad. My eyes started wet and teary as I began to stroke the pen on the paper. I completely wrote with my heart showing how lucky we were to meet Irene, as our first host when we tried Couchsurfing for the first time. Irene was the first stranger that we completely trust. I only knew her for less than a day, but I felt like I knew her for years. The farewell came, and surprisingly the kindhearted Irene brought a taxi already to stop in front of her house. She was willing to walk with her legs dipped in the flood, walked outside her alley to the main road to find a taxi. I really couldn’t understand how come in this world there was a kind person like Irene, even when we just knew each other for less than a day. Before we got into the taxi, I said goodbye and many thanks to Irene by giving her hug, a deep compassion hug. I felt very sad, and I tried my best to hold my tears. I know if I was too emotional, but it was my first time meeting a stranger who’s as kind as that when we only had few times to spend together. Irene told me to text her a SMS when we arrive in the airport to make sure that we were okay. And of course we did that. Until now I still get in touch with Irene (and I didn't forget to write her a reference on Couchsurfing, and of course she also wrote one for me). I think that I promised to tell you about another hosts I had, the male ones, but I wrote too much. So I keep that story later. I prioritize the first story for my first host, not because the others were less special, but because the first one always gave us the ‘ultimate’ feeling of being the first timer, the sense of first trial, first impression, that will last forever. There’s always a first time for everyone, and my first experience with Couchsurfing was beyond awesome. As I grow as an over-suspicious person, Couchsurfing has taught me important lesson in my life which are to trust the complete strangers, and to completely trust strangers.